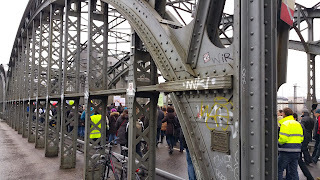 As a follow-up to yesterday's post on a continuing strike by European Patent Office examiners, I went to watch today's Munich demonstration. I figured I'd see a few hundred (of the EPO's 3,800 Munich-based) employees demonstrate, but the organizers announced a crowd of 1,100 at the beginning of their protest march from an EPO building to the Palace of Justice, and of 1,300 toward the end after other protesters, including members of technical boards of appeal (i.e., in-house judges), had joined. 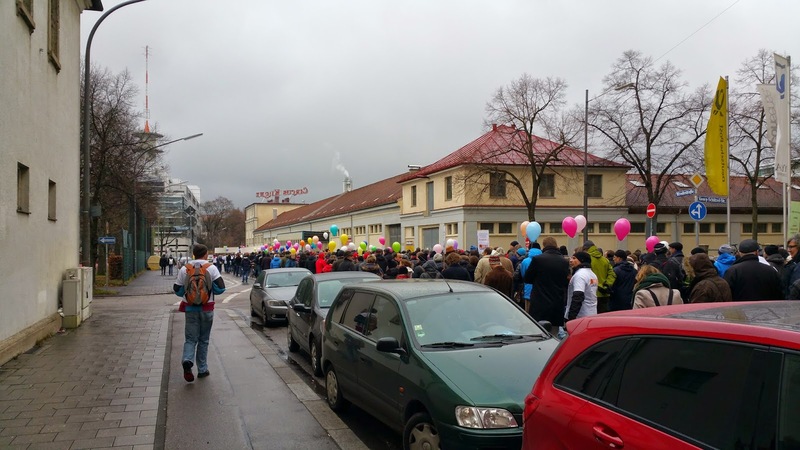 According to the organizers from SUEPO, the EPO staff union, this made today's Munich demonstration "the largest event in the history of the EPO." While I know that organizers like to overstate such figures, both numbers appeared very credible to me. 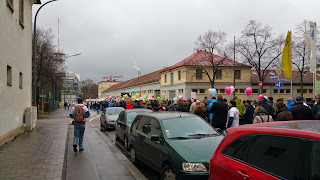 The protest march was impressively long (even more so when considering temperatures just slightly above freezing and the light rain)--so long that it was impossible to have the whole crowd on a single picture, even at the destination where a few short speeches were given. You can find a couple of other photos, and measured commentary expressing a certain degree of concern, on the IPKat blog. A Bavarian broadcasting company (probably radio, maybe TV) was also present, and even before today's protest, Frankfurter Allgemeine Zeitung reported (the article, along with English and French translations, is available here) about "strange things going on" in Munich. The FAZ article notes that the European Patent Organization (EPOrg) is run as a state within the state, an issue I mentioned yesterday. It's an autocracy that is above the law. 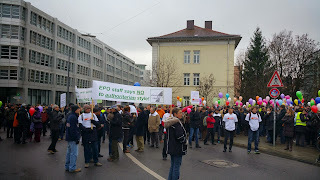 The SUEPO activist leading the march said today that whenever EPO employees try to raise human rights issues in judicial proceedings, the EPO's lawyers routinely argue the EPOrg is an international organization that is not a signatory of the European Convention on Human Rights, thus its employees (though they are all nationals and residents of member states of the Council of Europe, another non-EU body) don't enjoy the protection that goes with the European human rights charta. SUEPO proposes accession of the EPOrg to the Council of Europe as a solution to several (though not all) fundamental problems affecting EPO staff. Whatever little may exist in the form of checks and balances will be further marginalized or eliminated. Case in point, the EPOrg abolished an independent audit committee in 2011. EPO president Battistelli said in a 2012 interview (in French) that in his entire political career he'd never enjoyed so much freedom, not having to worry about parliaments or governments. "It's us who sets the rules, discusses them, and negotiates them." (It's unclear whether "us" refers to him and the Administrative Council, or just to himself in the form of a pluralis maiestatis). Such a deficient structure furthermore makes it all too tempting to create conflicts of interest for those who are meant to oversee the agency's dealings: the national public servants representing the governments of the EPO contracting states on the EPOrg's Administrative Council. One of the speakers at today's demonstration in front of the Palace of Justice said that the EPO recently started to pay for the health insurance of the national delegates to the Administrative Council. That should actually be a big-time political scandal in Europe. I heard that Administrative Council meetings are a boon for some Munich-based doctors, particularly dentists, as national delegates (presumably from, relatively speaking, poorer European countries) go to see them while they are here. I also heard from a multiplicity of reliable sources that the president of the EPO can easily silence critics on the Administrative Council by either offering lucrative cooperation projects to their national patent offices if they support him or by threatening to withdraw funding for such projects if they don't. This labor dispute is, as I already explained yesterday, not about money but about fundamental rights. One protester held a sign that said "No intellectual property rights without civil rights" and that makes sense. Others warned against a lawless space on European (or, specifically, Bavarian) soil. The only issue that was mentioned by the speakers in connection with compensation was that SUEPO opposes the idea of a performance bonus for examiners that could create a conflict of interest as examiners should be honest brokers between an inventor and the general public--an attitude that I like very much. As an alternative, SUEPO appears to prefer accelerated career paths based on the quality of someone's work. Toward the end, the deeply-rooted lack of faith of many EPO employees in the current president was expressed loud and clear as significant parts of the crowd chanted, in French, "Battistelli démission." There are some indications that EPO governance has never been more problematic than under the current president, but as long as the underlying structural issues are not addressed, there's no guarantee that a different president wouldn't be worse. Overly close ties between members of the Administrative Council and the EPO president (whoever that president may be at any given point in time) are a particularly important part of the problem.